IK Multimedia, the folks behind a number of popular music development accessories, have announced that the sequel to their successful iRig guitar interface – iRig 2 – is now shipping. 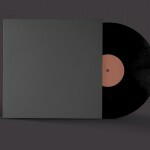 The product, which allows users to connect an iPhone, iPad, iPod touch, or even a Mac up to a guitar, can be ordered from the IK Online Store for $39.99. Compared with the first-generation iRig, iRig 2 brings a number of brand new features to the table. Among these are “adjustable input gain, cross-platform compatibility, and a 1/4 inch amplifier output,” according to IK Multimedia. These allow musicians to really take their guitar-powered music production to the next level using an Apple device, be it mobile or desktop. IK Multimedia’s iRig 2 connected to an iPhone handset. Its new 1/4“ amplifier output, in addition to its traditional 1/8” headphone output, allows iRig 2 to be plugged directly into a guitar amplifier or powered speakers without an adaptor. This helps to keep all cable connections tidy and organized. A new FX/THRU switch allows iRig 2 to send either a wet or dry signal through the device. 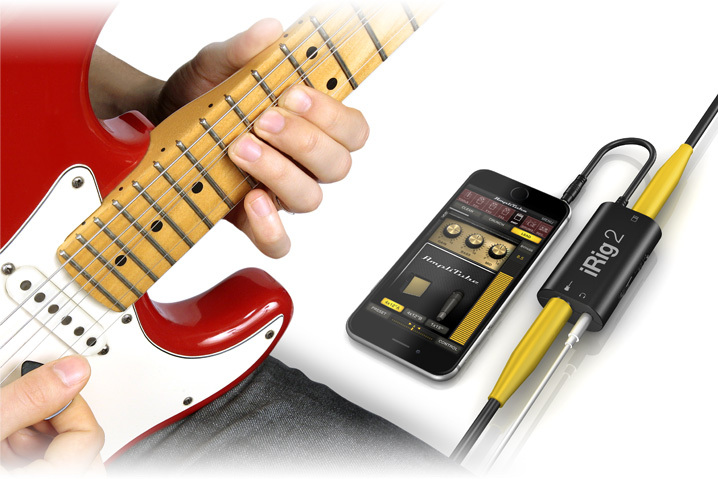 This means that guitarists can play live with an amplifier and use their mobile device with a tuner app, such as IK’s UltraTuner, or a recording app, such as IK’s iRig Recorder, to record a dry signal for further processing. Besides this, iRig 2 can also be attached directly to a microphone stand using a clip and velcro strip, both of which ship with the device. 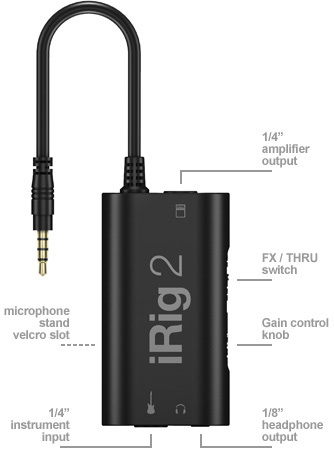 A closer look at the iRig 2. Compatible applications include IK’s own AmpliTube, one of the best studio recording apps for iPad which we had the pleasure of reviewing in-depth several years ago, as part of our “Musician’s Corner” series of articles. 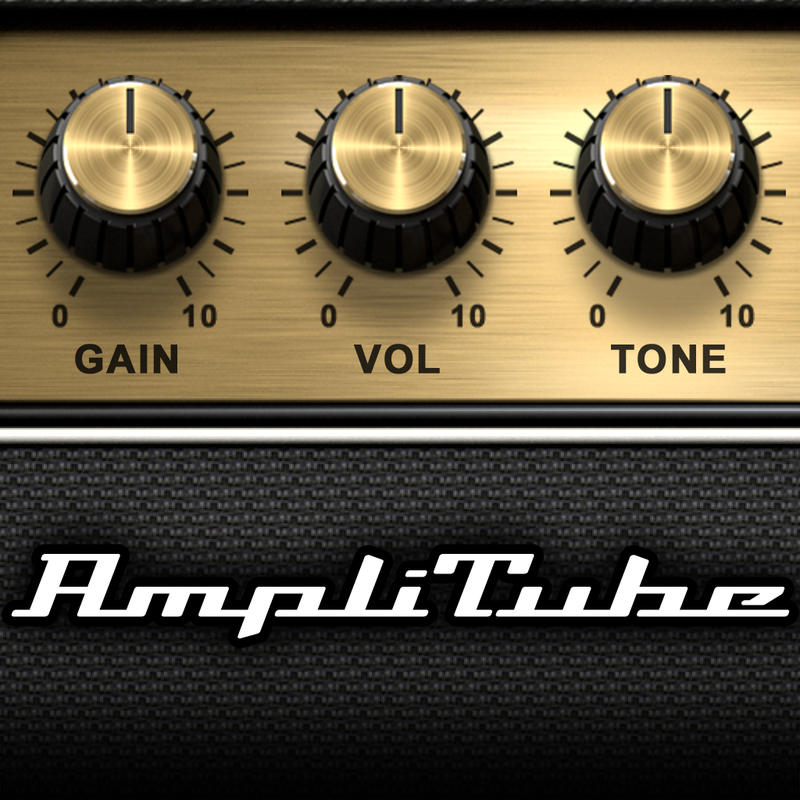 AmpliTube provides users with a huge number of stompbox effects, amplifiers, and other virtual gear which can really enhance your guitar’s sound. 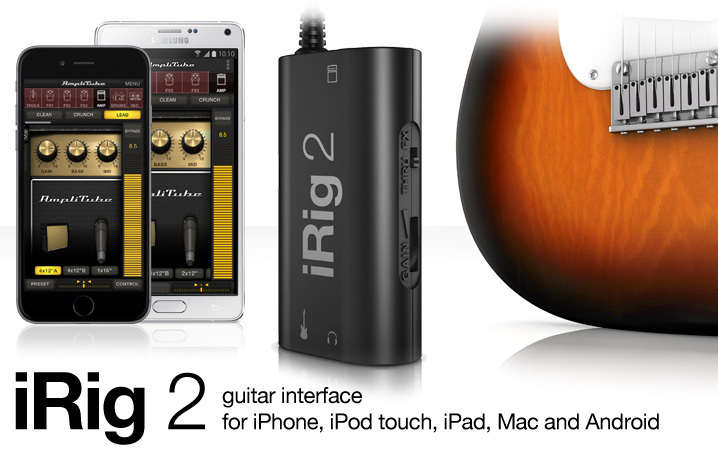 For more information on iRig 2, head over to IK’s website. As mentioned, the new accessory can be yours for $39.99, and it’s compatible with the iPhone, iPad, iPod touch, and Mac (as well as with Android and Samsung Professional Audio devices). Check out the new accessory, or see: Roadie helps you send stuff quickly and cheaply, Today’s apps gone free: Spirit Walkers, NedTheNeuron, ColorStrokes and more, and The Whole Pantry disappears from App Store after fraud claims.